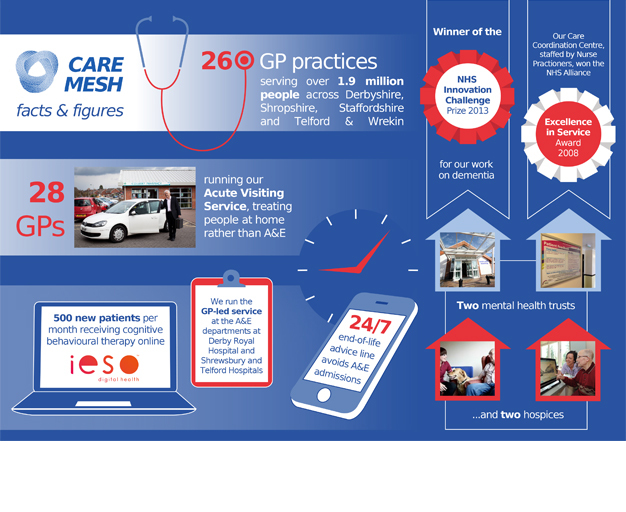 CareMesh brings together GP Practices, NHS Mental Health Foundations, charities and innovative private companies with the aim of transforming healthcare in Shropshire, Staffordshire and Telford & Wrekin. After designing their logo, CareMesh were looking for a visually interesting and fun way of promoting their services and accolades. We produced this eye-catching infographic using clean and friendly icons for use both online and in printed format, and even on mouse mats! Great design, we’re really pleased. Thanks very much, we love it.